VR: Over-Hyped or Just Getting Started? | VR: Over-Hyped or Just Getting Started? VR: Over-Hyped or Just Getting Started? 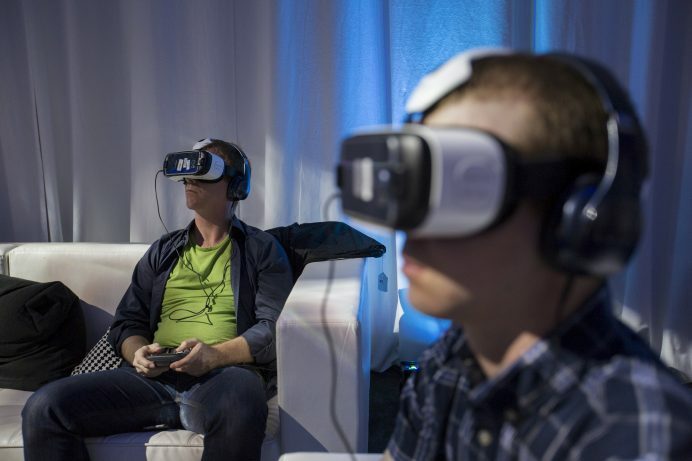 One of the latest fads to hit the market is virtual reality, or VR. VR enables users to escape from mundane realities and enter a 3-D form of storytelling that unfolds right before their eyes. While new VR devices have flooded the market in an attempt to gain a viable audience, it’s estimated that only 11.4 million Americans took the plunge and purchased a new VR system in 2016. Is VR really worth the hype? Or, will it simply fizzle out like the VR of the ’90s? Simply put, VR is a technology that mixes 3-D graphics to fool our perceptions of dimension, depth, and motion in order to create a lifelike display. This is possible by having the user wear a headset that completely covers the eyes to block out all other influences. For full immersion, users can also wear headphones so that they aren’t distracted by sounds around them. All of the main electronic manufacturing companies have taken advantage of this latest craze by putting their own spin on a VR device. As of now, the Samsung Gear VR, HTC Vive, PlayStation VR, and Google Cardboard are some of the most popular headsets on the market. While the Gear VR and the HTC Vive rely on high-end features to pull in users, the Google Cardboard is as simple as its name suggests, constructed entirely of a piece of heavy-duty cardboard. In fact, such a wide discrepancy in price and construction may be one reason why VR has become so controversial in recent years. With the power of VR, storytellers will now have a new medium to play with. There is limitless potential for video games, films, and documentaries, as they will be able to completely engage and manipulate the viewer. In addition to entertainment, VR could be used for many other scenarios, such as real-life training for law enforcement, doctors, pilots, soldiers, and more. Even better, it could allow disabled people to experience a full and vibrant life that they might not otherwise have the chance to live. Perhaps most convenient of all is how most people use VR sets. In most cases, the VR headset is controlled by a mobile phone, such as the Samsung Galaxy S7 smartphone from T-Mobile. This means that all you have to do is choose a video, press play, and watch the world around you transform. There are no troublesome wires or large machines to connect. While there are some affordable solutions out there, such as the Google Cardboard, most heftier VR systems have a much higher price tag that might scare away some buyers. Additionally, some units are heavy and require you to physically place your phone inside the unit, making them cumbersome to wear on your face. Sadly, while there’s interest in VR, there’s not currently a lot of content available for the technology. Old films and videos require different production standards, and because of that, there are not that many experienced content creators in the field. Once artists create more content, some experts fear that people may become addicted to the virtual world and spend more time inside it than they do in the real world. Despite VR’s limitations, trends only suggest that the number of people who own VR headsets will increase. In 2016, about six percent of the population over 18 years of age invested in a VR headset. Experts expect that number to jump to 16 percent by the end of 2017 and 27 percent by the end of 2018. Still not sold? These numbers are strikingly similar to ownership statistics of the iPhone in 2009, two years after Apple launched it. While it does look like VR has some kinks it needs to work out, it’s still a cool technology that will only get better as time passes. Hopefully, it will be able to overcome these hurdles and become a staple in the arsenal of modern technologies.